One of the best ways to keep your home comfortable is through proper mainenance. We offer a maintenance agreement that helps insure your unit will perform at a high level and last longer. If you become a KOOL BEAR CLUB member you can save money on your energy bills and give extra life to your heating and air conditioning equipment. Why do you need to join the KOOL BEAR Maintenance program? 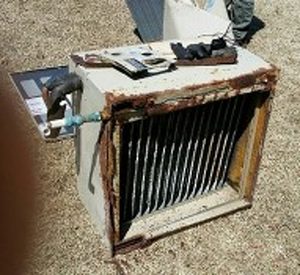 Because letting your heating and air conditioning unit go with out proper maintenance leads to failures like this. One of our expert service technicians will add you to thier preferred customer list. Your name will be added to our prioity call list. Night, holiday and weekend service calls have no overtime charges. You receive a 10 percent discount on all parts during a breakdown. As a KOOL BEAR CLUB member you also recieve our "No Sweat" guarantee meaning in times of a break down your name will move to the top of the priority list for service. At Dependable Heat and Air we use a polar bear in our logo for a very good reason. Polar Bears MUST stay cool. We understand just how much of a "bear" you can become when you come in from the sweltering heat and your home is hot and stuffy. It is our goal to keep Ada, and the surrounding area, cool all summer long while making your home warm and cozy when winter arrives. 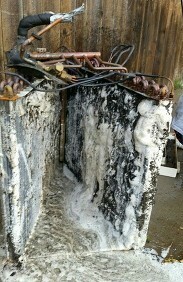 We have professional service representatives ready to keep you comfortable no matter what problems may arrise. We have established ourselves over the past 26 years in the Ada area as the #1 Heating and Air Conditioning Company. We take pride in our work realizing that the customer always comes first. Let us earn your trust today!